144 pages. Black and White. 9.84" x 6.69". 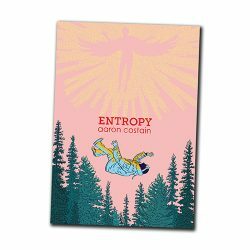 Aaron Costain’s Entropy follows a golem with a surprisingly modern sensibility, and an even more modern sense of style, as he backtracks through millennia to understand his own creation. Entropy takes place at the intersection of the world’s cultures. Mythologies and religions cross-pollinate, bleed into one another, and form a soul from synthesis – or they will if our epic hero can outrun man-eating giants, a vicious raven, a mute doppelganger, an angel and one very manipulative, slave-driving cat. Entropy delivers an all-time adventure. "I think if all big questions were asked in such an excellent mix of humour, terror and surrealism, I'd want to get to the bottom of a lot more mysteries. I loved every page."